I just got my latest copy of Threads magazine (July 2014) in the mail. I enjoy reading the wonderful and very helpful tips in there every month, but never before have I tried to stop EVERYTHING and create something from the mag! I’m not sure why I didn’t think of this, but Eyrlene Kammerer is a genius. Her article, “Ruler Keeper” (page 28) was just what the doctor ordered to keep my many rulers off of the floor and off thumbtacks. The project is simple yet uber functional. 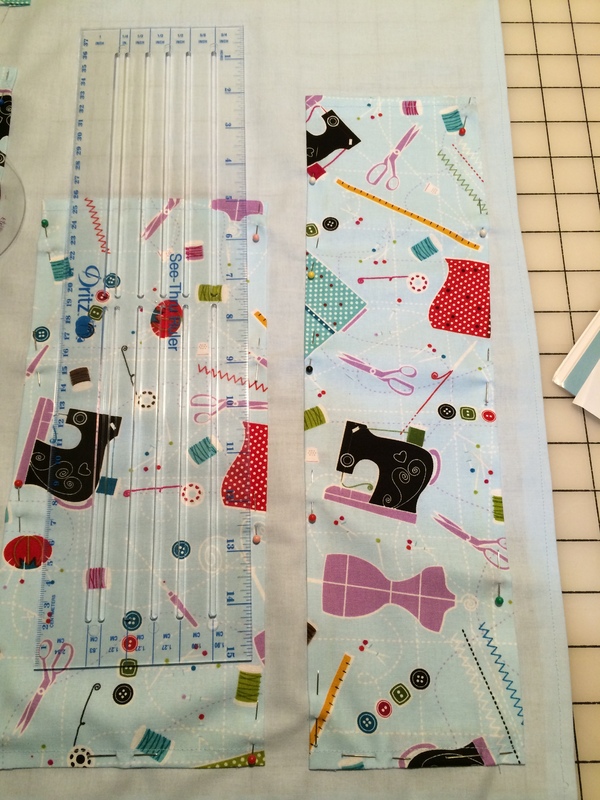 As a sewist, we are charged with having a bajillion rulers of all shapes and sizes. What they don’t tell us is where to keep them safe without drilling more holes into our walls. The key is to measure your rulers and put them on a base that’s wide enough to hold them all. The best functional detail is the strap that holds the L square nice and neat. 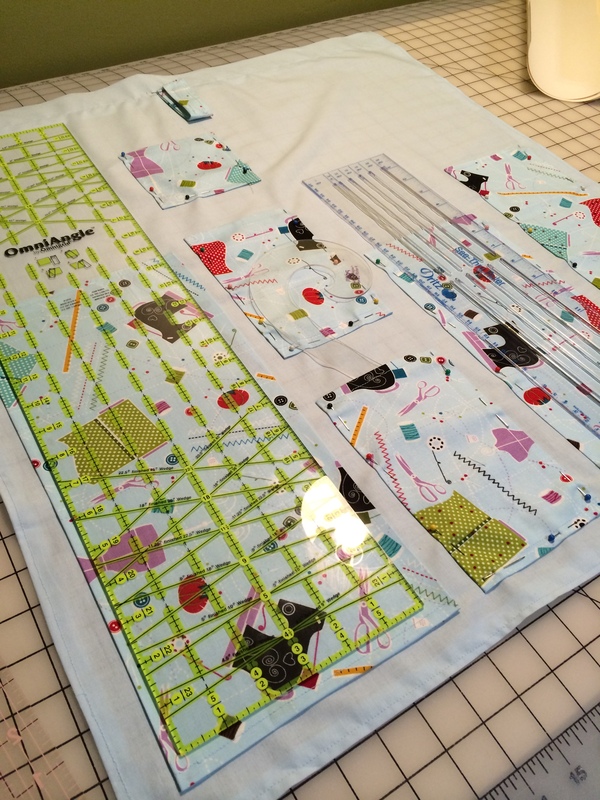 Make sure you pick up the mag and follow the very easy steps to create your ruler keeper. My one suggestion is that you add a very heavy interfacing to the base. The quilting cotton is just way to flimsy. I should have taken the interfacing from the top where the grommets are and covered the entire thing. 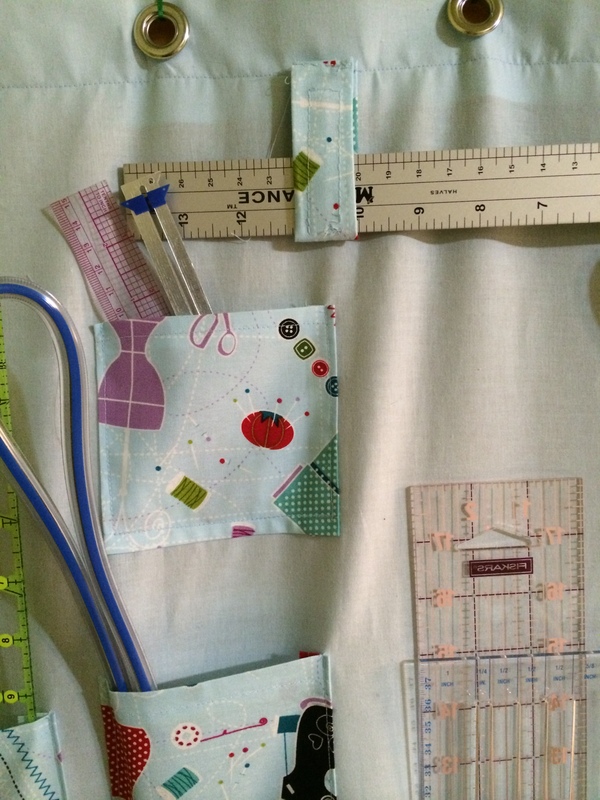 I joined a cool new Facebook group called Quick Quilt Saturday who’s mantra is to do “In your PJ’s Quilting Projects”. Every Saturday, they come up with a quick, simple project that you can bang out in an hour or so. 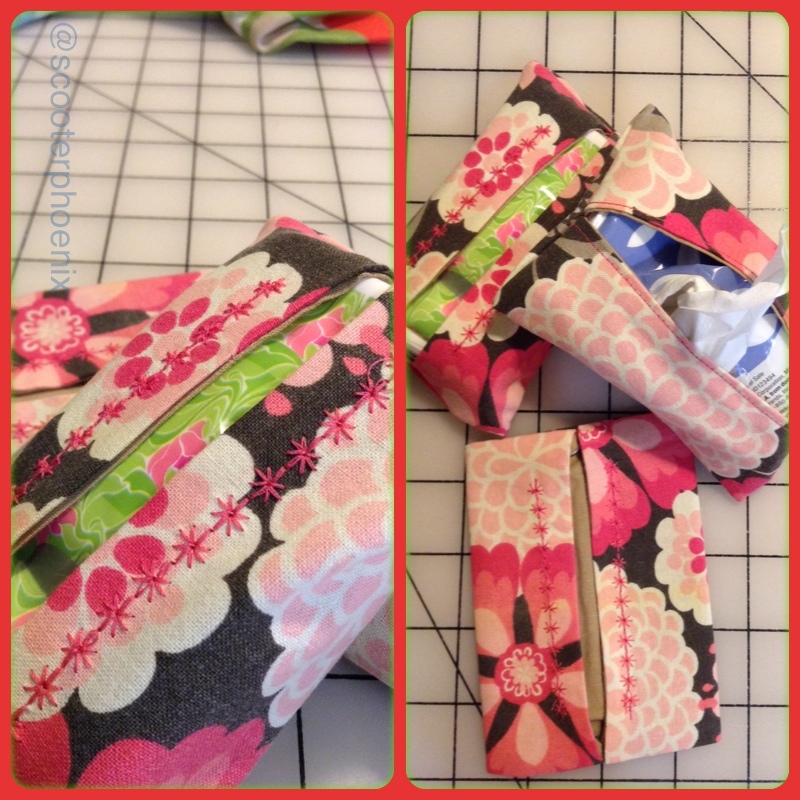 My first project this past weekend was 3 tissue packs made from scraps left over from my Riki bag project from last week. I chose to snazz them up a bit using a embroidery stitch on my machine that I never used before. Great to give as stocking stuffer’s or make enough to go into your many bags. For me, that would be my purse, work book bag, school book bag, and my gym bag. Last week’s project was a mug rug and fabric box. I’ll definitely get to that as soon as I can, I just need some batting. It’ll make super cute gift for a tea drinker along with a super cute tea cup and saucer. 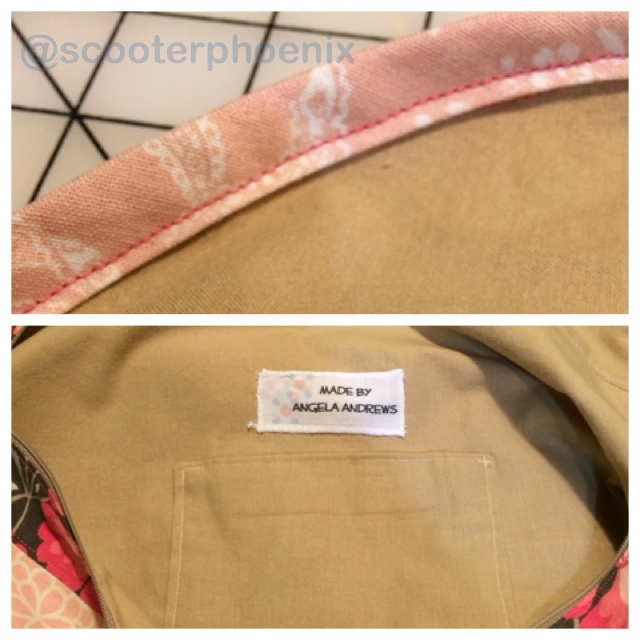 This weekend is a pot holder, it’s sort of lame, but anything that I can get my sewing skills up is good for me. A friend bought me a book called,”Bags – The Modern Classics: Clutches, Hobos, Satchels & More” by Sue Kim and I’m totally loving all the projects I could potentially churn out. There are so many wallets, wristlets, clutches and big bags in there. You could make a different bag for every look in your arsenal. This is my first project from the book. 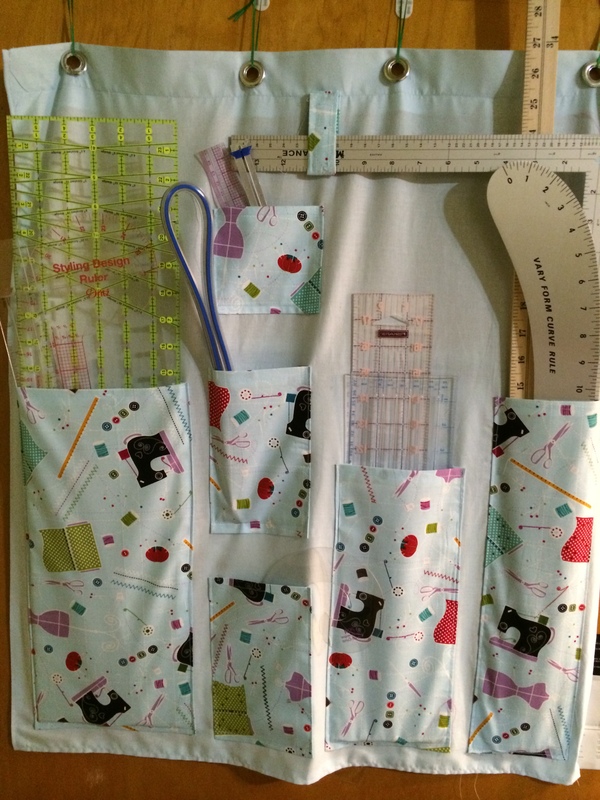 I used quilting fabric from Joann Fabrics as well as the notions. 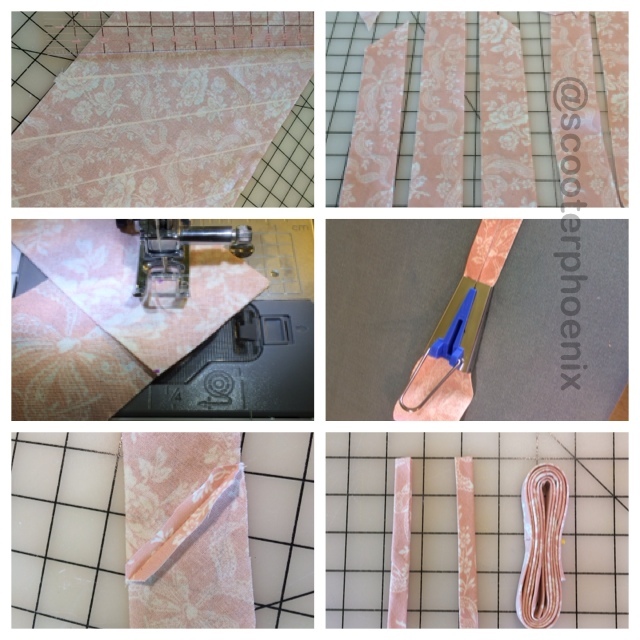 This project called for bias tape, but gave instructions on how to create your own. I’d never done this before, but I was game. I had to supplement the book’s instructions for a great tutorial from Colletterie.com to make the strips line up perfectly without those pesky tiny triangles. I hope to make more bags from this book. Don’t be surprised my friends, if you find some under your Christmas tree this year.